Whether you’re going to an interview or attending a networking event, your handshake is one of the most important first impressions you’ll make. A good handshake has the power to both diminish the impact of a negative impression and make a positive interaction even better, according to a Beckman Institute study. Believe it or not, you can screw this up. From Kanye West to presidential hopefuls, no one is immune to the awkward handshake. In an effort to leave nothing to chance, we want to help you get the handshake right the first time, and every time. So Monster spoke with two experts who have shaken more than their fair share of hands over the course of their careers: Patti Wood, a body language expert who spent three years researching handshakes, and Monster career advice expert Vicki Salemi, who spent 15 years in corporate recruiting. Their advice? Different contexts require different handshakes—different grips, different timing. They walked us through a few of the essentials. When you first meet someone and exchange hellos, Wood and Salemi agreed that you should be the one to make the first move. Wood says you can initiate the handshake from between four and six feet out. Eye contact is an absolute must, Salemi says. The idea here is not to get lost in your interviewer’s eyes. It’s to let the person on the other side of the desk know that you want to engage in a handshake. So, as you’re locking eyes, begin to extend your hand. Give the person’s hand a firm grasp to set the tone that you’re confident, that you’re owning it. But be careful: There is such thing as being too firm. Salemi says someone once squeezed her hand so hard that it actually hurt. Job search 101: Please don’t injure your interviewers. It’s important to be in the moment and not rush a handshake, Wood says. “See it as an act unto itself, rather than just something you do to get to the other side of it,” she says. As for how long the handshake should last, Wood says a few factors come into play—like geography, industry and culture. For example, in New Jersey, Wood says people give five to seven pumps—or up-and-down motions—in one handshake. But California, which has more of a casual culture, is more of a “one-pump” state. It varies across industries, too. In health care, for instance, it might be one shake, but it might be slow and lingering due to the nurturing nature of the industry, Wood says. Alternatively, in tech and IT fields, handshakes tend to be faster and choppier. Wood recommends going to networking events to pick up on these subtle (but important) differences. Now you can let go and continue your interaction. Hopefully, all of that went well, and you’re set up on a positive note. But sometimes, no matter how great you feel your handshake is, the encounter can still fail due to awkwardness on the other side. Maybe the person doesn’t like to be touched or is a major germ-aphobe. 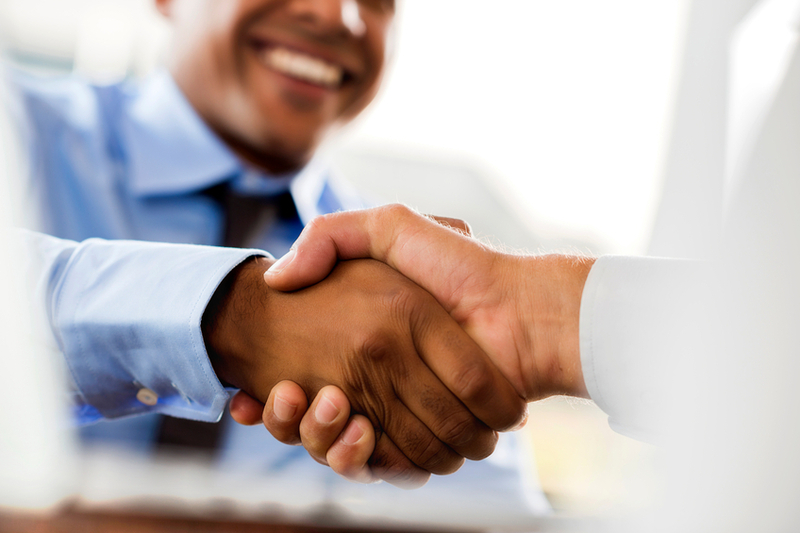 At the end of the interview or conversation, shake hands again as a way to seal the deal. “Think of a handshake like a period at the end of a sentence or like a wonderful exclamation point,” Salemi says. What are you waiting for? Grab a friend and start sharpening up your shake. Just please don’t do this in your next interview.